This is a description of our Literacy programme, but it should enable you to set up your own literacy programme using resources you have made yourself. For further advice do contact us at office@candleaac.com. We are happy to help you to set up a literacy programme with single students or groups of students without charge. If you would rather buy resources, our sister company, sales@candleaac.com can be contacted. The staff team at CandLE have spent many years researching and trialling various approaches for teaching literacy to students who have complex communication needs and/or rely on Augmentative and Alternative Communication (AAC). The first resource was developed by Marion Stanton (Lead teacher and assessor at CandLE) over a 15-year period and is called ‘Phonics for All’. Initially she planned the programme, with the support of a Speech and Language Therapist, around the needs of one student. Over the years, many students have been found to benefit from it. ‘Phonics for All’ and all of CandLE’s other resources will be described in detail in the relevant sections of this document but first, an explanation of how we arrived at the programme. 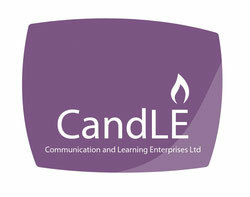 Staff at CandLE have considerable experience with optimising physical access to AAC low and high-tech devices. Marion has worked in Occupational Therapy as well as being a teacher. This knowledge has led to the development of our ‘Access for All’ communication book. The design, ℗ Marion Stanton, is a cross pattern rather than the conventional arrangement of placing options in the four corners. This was trialled with several students who rely on AAC and in every case targeting accuracy improved. Feel free to use any of the ideas you read here to develop your own resources or mix and match your own with purchasing some resources from our sister company if you wish. ‘Literacy Resources for All’ is a comprehensive literacy package which can be accessed by students who rely on AAC (Augmentative and Alternative Communication) and/or who have complex needs. The program is also useful in a wider context; we have found that what works in AAC works for all – hence the name! These six elements take the learner through from no known literacy skills to age appropriate ability levels. o Text level assessment (assessing comprehension of text with increasing levels of difficulty) is in development. o Adapted reading scheme is in development. A full dictionary and thesaurus. o Curriculum and thinking skills activities. The CandLE Literacy Programme in Detail. The means, reasons and opportunities model of communication was created by Della Money almost 30 years ago for people with learning or physical difficulties, ever since work with those with communication impairments, (including our population of AAC users), has been underpinned by this model. The principles of the model are that to communicate effectively everybody needs the means, (the ‘how’ someone communicates/ their system), a reason to interact, (e.g. to persuade, argue, describe) and opportunities need to be available in order for communicative exchanges to occur, (including having responsive social partners who engage in conversation, don’t anticipate and are able & willing to wait for responses). Those around a young person who is developing their communication skills have a responsibility to create, engineer or capitalise on all opportunities to communicate, to model the multitude of reasons language is used for and to ensure that the means they have is functional and evolving. When practitioners are aiming to ensure that their young people are provided with optimal communicative conditions then it is best to visualise Money’s model in it’s Venn diagram format, with the central segment, (where all factors are overlapping), being the ‘gold standard’. If a student’s needs are all predicted and no opportunity is created for them to influence their life, then their means of communication can be redundant. Also to use communication to their full potential, for a range of language functions, then the beliefs and expectations of those around each student also need to be that they have ‘capacity and the ability’ to use and develop their means of communication. In short; finding and developing a tool for a young person to communicate with is just the start of their journey towards them being able to express themselves. The environment that they are exposed to, the attitudes & expectations of those around them, the modelling of their communication system, the opportunities created and the young person’s motivation to want to share information, (not just answer questions), are all factors which impact on the success of their use of the communicative tool (means) provided. Jackie Dearden and Ann Emerson (2013) have developed this approach into a scheme they call MORE, Means Opportunities Reasons and Expectations. They argue that raising expectations and providing access to literacy at a very early age can make an enormous contribution to development of the young person who relies on AAC. Students use their communication systems to complete a page of Predictable chart writing. If the students are not yet at a stage where they can use a communication system, they can make choices from the Predictable chart boards that are designed to go with each page in the Predictable chart booklet. If you are working with a class of students, you may wish to create a larger version of the chart on a flip chart.